I've always liked the idea of a Graze Box but it wasn't until recently that I really thought about getting one. I was actually going to pay for it but my problem was I wasn't sure how big the box was so kept being put off by it. Then over the weekend I got the Amazon gift voucher and included with it was a code to receive a free box. Of course I jumped at the chance and received my box today. I absolutely love it but the problem for me is that our postbox is too small even though its made to fit through a standard letter box. I had planned on continuing to get them but now I don't think I will for the reason that the postmen already get really ratty with my mum as they don't use the door bell so wonder why she won't answer etc... Also they come at a time when my mum goes to collect my niece so I'll have to collect it from the sorting office. It's all such a pain to think about it, I feel quite sad about the whole thing but who knows maybe this year I'll get a house and then can continue with it. 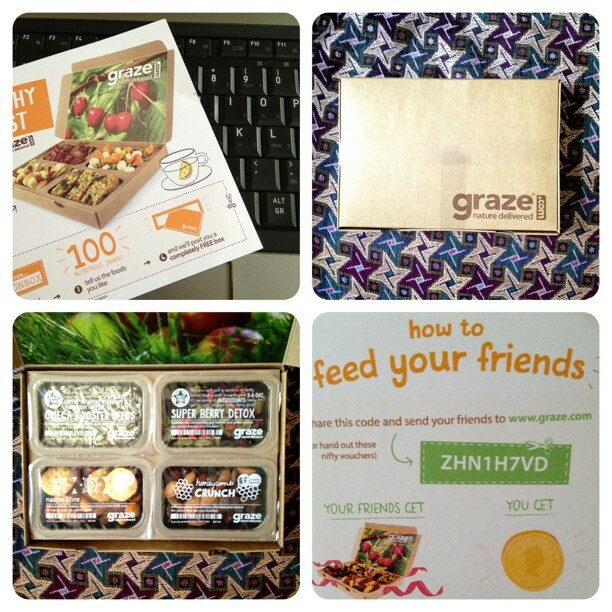 If you would like a free graze box you can use the code above. Enjoy! Its a snack box that you can choose to have sent to you on a weekly, two weekly or monthly bases. You get 4 different variety of things. I've gone for 2 weekly to see how it goes with me first. I would like it weekly but as I said it doesn't fit in my letter box so its a pain someone always being home. I really enjoyed mine, I've signed up for every 2 weeks but I feel at a loss already in what to eat.